NOW® MSM is tested to contain a minimum 99.7% purity. numerous different types of tissues found in the human body, including connective tissue such as articular cartilage. 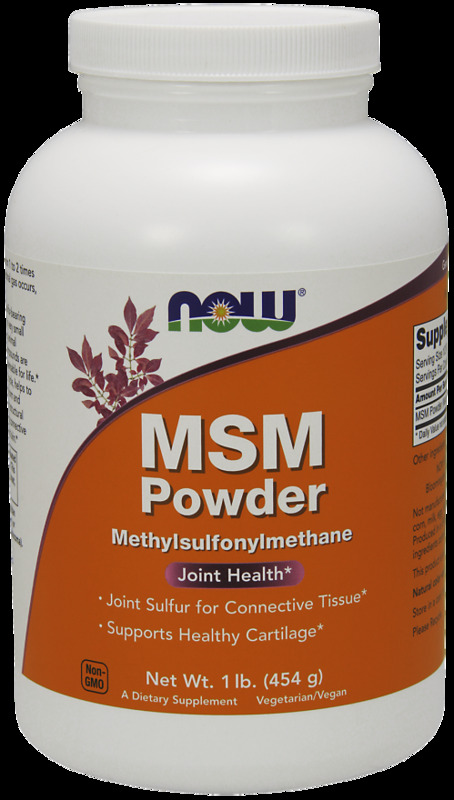 * While MSM is a natural component of almost all fresh fruits, vegetables, seafood and meat, food-processing methods reduce sulfur levels, making supplementation more important than ever. As a dietary supplement, take 1/2 teaspoon 1 to 2 times daily in juice or other liquid. If intestinal gas occurs, reduce dosage. Contains no: sugar, salt, starch, yeast, wheat, gluten, corn, soy, milk, egg, shellfish or preservatives. This product is sold by weight not volume.